Did you notice the shirtless men in the crowds watching Olympic events held in Sochi? 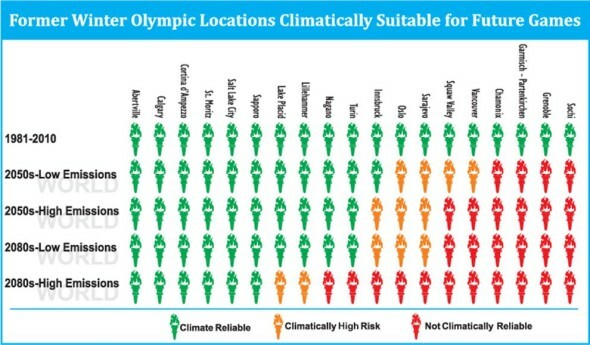 The warm temperatures for the 2014 games will likely be recorded as the warmest Winter Olympics ever. The Canada Research Chair in Global Change and Tourism at the University of Waterloo, Daniel Scott, has been studying the relationship between sports, recreation, and the environment for decades. His research became of note back in 2010 when Canada hosted the Winter Olympics in Vancouver; the warmest winter games ever. The Nation Geographic Daily News published a story on the trend for those interested; read Climate Change Threatens the Future of the Winter Olympics here.